To get an exact offer, please send us technical details or description of a part and we shall make a proper calculation and shall answer your questions. 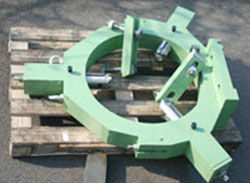 Upon client’s request we deal with making or producing non-standard machinery and appliance elements. Thanks to our production elasticity we are able to supply any elements to the following appliances: Crushers, liquid pumps, compensators, machine tools and to many others. In the photos we present only a narrow scope of our offer “to order”.